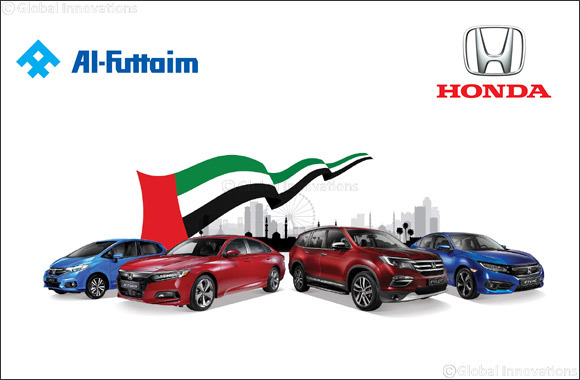 Dubai, November 27, 2018: As a part of the UAE National Day Celebrations, Al-Futtaim Honda, exclusive distributor of Honda cars, bikes, marine engines and power products in the UAE, has launched the Honda National Day Big Shopper Offer at the Big Shopper Event at Sharjah Expo. Valid from November 28 to December 2, the National Day offers provides customers with the best opportunity to buy their dream Honda and save up to AED 11,000. The Honda National Day Big Shopper Offer brings new discounted prices to customers allowing them to make massive savings while purchasing selected Honda models. The offer extends along four models from Honda’s lineup of sedans and SUVs. Exclusive to the Big Shopper event, this offer will see huge discounts on Honda’s flagship SUV Honda Pilot EX 2WD, where customers can save AED 11,000, and get for AED 104,900. Fans of Honda’s flagship Honda Accord LX Turbo Sport can avail a discount of AED 7,500, making it available for AED 99,400. The sporty Civic LX Sport and the compact and stylish Honda Jazz EX both will be offered with a discount of AED 6,000 from its original price, coming down to AED 68,900 and AED 53,900 respectively. Al-Futtaim Honda provides all customers with 5 years unlimited mileage warranty, roadside assistance and a trade-in option for all makes and models.